"Strap yourself into the cockpit of a Wildcat or a Zero. In 1942: PAW, you experience the ultimate simulation of daring air combat in the South Pacific. Chase down Wildcats, Corsairs or Zeros through relentless gunfire, harass enemy shipping with low-level, wave-skimming torpedo runs and perform gravity-twisting dive bomb attacks that will leave you glued to the back of your cockpit. Your task force is depending on you. Your open cockpit awaits you on deck. Get in there and mix it up." - game blurb. 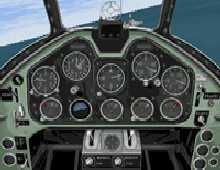 1942: The Pacific Air War is one of the best World War 2 flight sims ever made. This MicroProse classic is the breakthrough sim that led to the immensely popular European Air War -- which was based on an improved version of 1942: PAW's engine -- years later. As to why this is a true classic, this MobyGames review says it all: "The Corsair, the Zero, Wildcats and Hellcats. I love simulations of the air war in the Pacific in WW2. The extreme mismatch of dogfighting styles, the carrier landings and take-offs, the diving through flak and fighter cover to bomb capital ships... 1942: The Pacific Air War models all these things. Carrier landings are a risky task that requires practice (or extensive use of the auto-piloting feature). Japanese fighters will weave in and out of your formations, while American fighters will brazenly bust their way through in run'n'shoot maneuvers. The planes behave fairly accurately (granted my real flight experience is merely in an period trainer) and fuel and ammunition limitations are always on one's mind. For their day, the graphics were pretty and, aside from being in an incredibly low resolution, are passable these days still. The planes have detailed (considering the resolution) skins, while the lesser used objects, like ground objects and ships are more simplified. More important, the graphics serve their purpose, although sometimes the blue painted fighters can be lost against the texture of the sea and the green fighters obscured by the green islands, but this is actually something pilots had to deal with the whole point of the color schemes to begin with. Not everyone will like the overly realistic issues. You need a steady hand, a good judge of alignment, and patience to score kills. Otherwise you'll just spray your very limited ammunition across the sky. Fortunately, players who don't want to deal with this realism can turn on options such as unlimited weaponry."